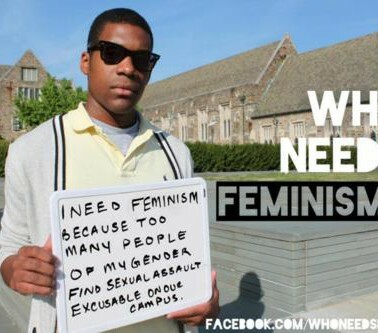 I would be the first to admit when a guy tells me he’s a feminist it is often met with a large amount of scepticism. Are they just jumping on the bandwagon for a few extra brownie points? What changes have they made in their life to live out this “label”? Thankfully, the conversation with my friends didn’t go like that and I can say none of these men would behave in such a way. I was, at times, surprised at their answers, especially when I underestimated their awareness. There were also moments where I had to bite my tongue, which is probably news to them as I imagine they would hardly consider my responses restrained. We first discussed the dictionary definition of feminism; “the advocacy of women’s rights on the ground of the equality of the sexes”. All the guys agreed feminism was a common sense belief that they aligned themselves with. However, it was clear that the advocating part was not as easy for them to relate to and was almost forgotten as being a focal point of the movement. These men would no longer be considered junior in their professions, some are already in management roles. From our chat, everyone was able to identify when a situation was a bit dicey but being the one to stand up and point it out, especially to their superiors (with the exception of one or two), just wasn’t going to happen, “it’s easier for me to go on the march than it is to call my boss out”. This stemmed from the same place women have used for decades, they feared being excluded, professionally punished or losing their status in the company. One of my friends, who would say he is pretty educated on a lot of the inequalities around him, knows that working in a top-tier professional services firm as an ethnic minority is not easy when you don’t fit into the archetype. He described his astonishment at the starkly different level of racist and sexist commentary in the workplace between the capital of New Zealand and the capital of the United Kingdom and how calling it out in the UK was a lot more difficult. “In Wellington, if anyone said anything biased I would comfortably call it out across the office floor but in London when I made the most minor comment questioning a partner’s remark it was responded with an intimidating shut-down and calling me ‘the fun-police’”. They all agreed that they looked forward to a few years down the line when they were more senior and able to set a higher bar for a more equal workplace; a fairer environment that supported women, especially working mothers. As a woman I’m always pretty dubious about the WhatsApp group chats men around me are a part of. I know guys who said when the private Emily Ratajkowski and Jennifer Lawrence photos were leaked their group chats “blew up that day”. When I brought this up on the night, the guys pretty honestly said they wouldn’t partake in overtly sexual conversations about a photo of a woman passed through a WhatsApp chain. In fact, they acknowledged that guys who did that in these groups would be seen as overcompensating for their own shortcomings. Group chats on their phones were easy to navigate; to reply would require them to actively think of something to say they know would be wrong. In-person banter (AKA “locker room chat”, “lad chat” or “bro chat”), while not horrific, was “easier to slip into”. A sexist joke about their girlfriend staying home on a Friday night in the kitchen was common, but with anything too explicit most of the guys said they would try to change the subject or even walk away from the chat. When discussing inequality in social settings, I noticed there was a fine line between a distasteful joke and sexist banter that made it difficult to debate or talk about in specifics, perhaps because there was no hierarchy or professionalism like you would expect in the workplace. I ended by straight up asking my friends if they felt they had a part to play in feminism. Two said yes instinctively - the two who were particularly well read on the patriarchal society we live in. Another two said yes with regards to “the stuff [they] can control” and reiterated they weren’t going to physically stand up and intervene until they were more senior in their professions. One said no but the vibe I got was that he was basing that off not being a person who would spend his free time educating himself on feminism, “attending seminars and going to marches”. Despite his examples of treating women equally in both his workplace and his social life and his knowledge of an unequal society between men and women, I got the impression that he felt that in order to have a part to play he had to go the whole nine yards, wear the t-shirt and everything. A few days after our conversation I heard that our chat had caused moments of reflection and a recognition of things that were previously unobserved which I was, of course, heartened by. Ultimately, my friends represented the common man’s opinion on a common problem. Our conversation was both surprising and unsurprising. They shared the familiar fear of exclusion in the work environment and while the desire to more actively advocate for an equal workplace in a few years was admirable, the only other female at the table poignantly said, “that’s all very well for the generation after me”. N.B. I appreciate this article is a very small window into the many viewpoints of men and their place in feminism. With only five guys to chat through this with I tried to organise a group who would represent as many different opinions as possible and I’m so grateful to them for giving up their time and being so open with me. I’m also incredibly grateful to my dear friend who worked with me to structure the chat so that we could have the great conversation that we did.